The proverbial idea that “practice makes perfect” seems quite sensible. If you continue to practice a certain skillset you’ll eventually master the process and improve much quicker. But practice doesn’t just mean doing the same stuff over and over. To improve at design requires a routine or method of practicing which every-so-often pushes into uncharted territory. 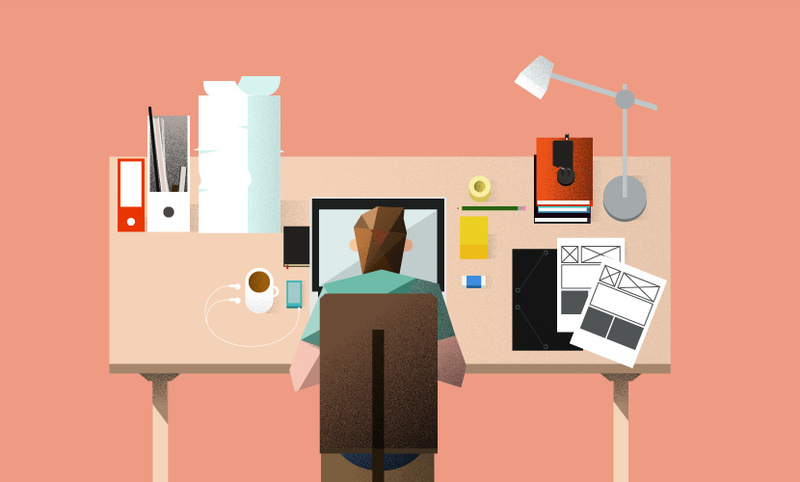 Someone with time and patience can find dozens of resources to improve their design skills. From guided video tutorials and web design podcasts to quick tutorials, the supply of helpful material is seemingly endless. All that’s required from the aspiring designer is to have persistence and practice. You may not see improvements in a week or even a month – but if you put in the hours you will eventually see results. When first starting out many people will go purchase books on Photoshop, Illustrator, and other design programs. Depending on the book this might be a great idea – but keep in mind that books are really more like guides for beginners. The same goes for design tutorials which teach how to create a very specific item or interface. You won’t become a master by just following books or tutorials. These are certainly amazing tools for beginners to learn about the interface and general workflow of a new program. However to become really great you’ll need to rise above and just experiment. Unfortunately you can’t find tutorials that explain how to do everything. Most tutorials focus on a particular tool or a series of steps to create something(camera icon, wood texture, repeating pattern, etc). By following tutorials that pique your interest you’ll learn a lot of the fundamental concepts. These concepts may then be carried over into future project work. So when it comes to book learning and tutorials remember to expand your boundaries by testing things on your own. If you find a tutorial which explains how to create a certain effect then kudos! But you won’t always be able to rely on tutorials for everything. It’s best to learn your foundations through step-by-step instruction and then venture out on your own. Perhaps the one big trait which has helped me along the way is asking for help whenever I needed it. Sometimes you’ll know other designers in real life who can offer specific techniques or handy tricks-of-the-trade. But even when you’re practicing alone there’s still an entire Internet full of talented designers willing to help. Be sure to look around the many design communities and keep some of them bookmarked for future reference. Sign up for an account on different communities that seem helpful and willing to answer questions. Places like Graphic Design Exchange or specific subreddits like /r/photoshop have a very open and honest community. Just be sure to really clarify your question before asking. If you have a screenshot of an interface or icon that you want to recreate, ask how to specifically design some part of the image. People will be much happier to explain very specific things rather than detail a whole step-by-step from start to finish. An interesting quote I’ve recently read is that “good designers copy, great designers steal”. While I don’t agree 100% with this idea it rings true in many areas. Specifically that when you’re not-so-good and want to become good the best thing you can do is copy. When it comes to non-commercial practice work there’s an enormous amount of value in copying. Obviously you might try copying other websites by recreating them in Photoshop or Illustrator. But the alternative is to copy great design work posted by other designers in order to learn their process. I would absolutely recommend Dribbble as the go-to design community for copying quality ideas. Even if you’re not a member you should be able to browse through the site and pick some of the most intriguing designs. Push yourself to recreate the design exactly as it should look using whichever software you prefer. When you’re forced to recreate something from scratch it requires a larger skillset. This includes traditional fundamentals along with more specific techniques like layer effects or smart filters. You’ll need to understand how to blend patterns to create textures, or mix colors that look good on the same page. As you start re-creating designs you’ll learn a lot more about fundamentals like composition and color theory. You’ll have mini-revelations that explain both how and why a design was created in a certain fashion. This method is how you can really level up to the next stage. Force yourself to rebuild icons or designs that catch your attention. Make it a challenge and push yourself – when you’re stuck ask the community for help. Rinse & repeat for some outstanding results. All of these suggestions don’t amount to a hill of beans if you can’t actually practice on a regular basis. At first you may only dedicate 1-2 nights a week. As time goes on you may set aside an entire day on the weekends just for practicing. The more time you put in the quicker you’ll see results. But remember that you also need to push yourself outside of each new comfort zone. It’s easy to get comfy-cozy and just accept your skills at a certain level. But at this stage it’s important to attempt new ideas you want to build. The main point is setting aside time to push yourself. Once you’re comfortable doing design work it may turn into a job, and it’s tough to improve your skills when you’re also working on client projects. Make some time for improving yourself to stay on top of the market. No matter what type of design work you’re looking to improve, the qualifying factor is to just keep practicing. Although not all practice is created equal, some practice is 10x better than no practice. So use these tools along with your own ideas to create your own practice routine. No matter what you choose to practice or how often, the most important component is to stick with it. If you can practice on a regular basis then you will see improvements, no questions asked.